You’re that kid who was mesmerized by your dad’s camera and when he finally let you use it you never gave it back. You’re the one who, instead of paying attention to your math teacher, sat in the back of the classroom endlessly drawing pictures in your notebook. And you’re the kid who was always hanging out in the art room, or perhaps you’re the one who picked up that dusty old video camera from the closet shelf and became the family Spielberg at 9 years old. I know who you are because I am you. 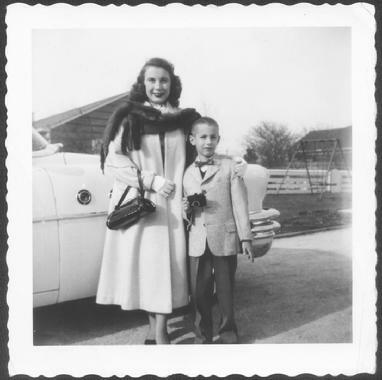 Yeah, that’s me with my mom…Easter Sunday, 1957. Yes, I know you: you have that special creative gift, that mysterious “something” that excited you from an early age and which manifested itself as a talent others admired. Despite the risks and the nay-sayers you’ve chosen to make your passion into your career. I can relate: I’ve been there, and having experienced both the highs and lows of creative entrepreneurship I established cr8vstrategy to help make your path to success a relatively smooth one.